The topic came up in Body positioning while using a jointer of jointer safety. While I've never had any issues, an accident on a jointer could be very dangerous. What safety precautions should I take when operating a jointer? Use the proper personal safety gear, like eye and ear protection. Don't disable or remove the spring-loaded guard. It's there for a reason. 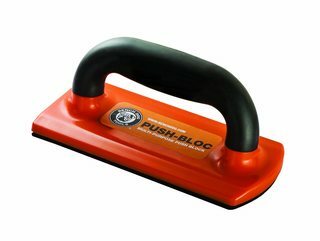 Use a pair of flat push blocks with handles and rubber pads on the bottom for friction. Using this type of push block will allow you to safely maintain downward pressure on the work piece while it's over the cutter head. You may also want to use a variation of this with a cleat for your trailing hand to allow a better grip for forward feed pressure. As @TX Turner mentions, "When surfacing, never place either hand directly over the blade while pushing stock through." Keep your hands away from the leading edge of the board when it's only a few inches onto the outfeed table. A sudden kickback with your hand in that position could lead to it getting drawn into the cutter head. Stand to the side of the jointer, and stay out of the kickback danger zone behind the machine directly in line with the cutter head. Be especially careful in your inspection of the lumber for nails and staples if you're using pallet boards or reclaimed lumber. These can damage the knives and cause some serious kickback. Check your jointer directions for the minimum recommended length of stock suitable for working with. Don't try to joint any work piece shorter than this length. This old Shopsmith pamphlet (PDF) has a bunch of good tips on safe jointer use, although some are specific to the particular model. If you're not too squeamish, here's a good resource (PDF) with a lot of jointer accident and close-call descriptions. I find learning from others' mistakes (and missing digits) helps me keep all of my fingers intact. Plan your cut from start to finish. Know what you are going to use to push the lumber (push blocks, hands for edge jointing, etc.). Think about if your hand falls, where it will go and make sure that they won't contact the blade. If you have doubts, don't cut. Seek advice from an experienced woodworker. Make all adjustments to the machine with it off and locked out or unplugged. hands never get withIn 3" of the cutter (good general rule with machines), and never near the end or the board where it could slip from under you. never push toward the cutter if there's any possible way to avoid it -- that author recommend a "push stick" that's about 2' long and has a hook at the back, and switches to that as soon as the back end comes within reach. Switch from pushing the board to pulling it (from the outfeed side) as soon as possible. Walking the leading edge past the cutter is part of that; start cutting with your feet pointing in the right direction for that. Cupped side down, If board is bowed/cupped. You'll cut more easily and lose less wood, and the board will be less likely to rock and ruin the pass.. If the board is twisted, picking the best orientation is a judgement call. Cut to rough size before jointing. Safer -- and less work and less wood lost since a shorter section generally has less total curvature. Exception being when board gets too short; under some size (6"?) it's hard to safely control. Also, if too thin it has nasty habit of "diving" into the cutter. Older jointers have a "rabbeting ledge" feature. Ignore it. Dado blade in the saw, or router, or router planes are better/safer solutions. Do not joint short stuff — say, less than 12 inches or so — lest Bad Things happen. Do not face joint small stuff (say,less than 1/4-3/8 inch thick or less than 1 inch wide). Take thin cuts, 1/32 or 1/16 tops. 1/8 at the very, very most. Easier on the motor, easier on the knives and its safer. Unless you know what you're doing (and why), don't muck with the outfeed table. If you working with long and/or heavy stock, have someone assist you. Don't stand inline with the infeed end of the cutter table, lest you take a kickback in the abdomen. If you're adjusting the machine, unplug it and lock it out. Don't need nobody energizing it while you're under the hood, so to speak. Not the answer you're looking for? Browse other questions tagged safety jointer or ask your own question. Do I need to worry about wood dust for very small-scale manual sanding? Is it appropriate for an 8 year-old to act as a 'helper,' ripping sheets on a table saw?